Acorelle Organic Hair Removal Strips for Body are the 1st 100% natural organic and hypoallergenic wax strips ! Enriched with soothing organic argan oil and moisturizing organic aloe vera, the strips have a hypoallergenic formula made to minimize skin irritation and respect the more sensitive skins. They are efficient even on short hairs, with long lasting results for a soft skin up to 4 weeks. Acorelle Organic Hair Removal Strips for Body are ready to use for an express hair removal, without any heating. They come with an After-hair removal care with organic sweet almond oil to eliminate any wax resiudes and to soothe the skin. No perfume, no colophane and no paraben. 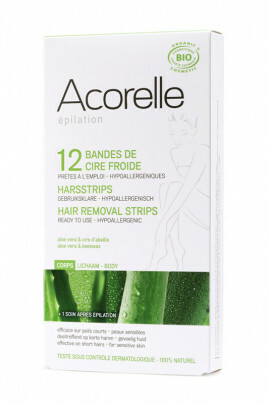 Acorelle Organic Hair Removal Strips for Body are ready to use, no heating required. Warm the strips with your palms, peel them to split the double strip, apply on the skin by smoothing it towards growth direction, then swiftly pull of the strip in the opposite direction of hair growth. Apply the After hair removal care with organic sweet almond oil right after to soothe the skin and eliminate wax residues. Organic certified hair removal wax with 100% natural ingredients ! GLYCERYL ROSINATE, RICINUS COMMUNIS SEED OIL, CERA ALBA*, ARGANIA SPINOSA KERNEL OIL*, HELIANTHUS ANNUUS SEED OIL*, ALOE BARBADENSIS LEAF EXTRACT*. Très déçue, une bande de cire colle une seule fois, après plus rien ! 1 boîte pour même pas une demi jambe, c'est vraiment l'arnaque sur ce produit !! J'ai acheté ce produit et je suis très déçue; il ne fonctionne tout simplement pas sur les poils des aisselles, heureusement qu'il me restait un fond de boite de cire orientale et que je n'avais pas perdu le coup de main pour m'épiler toute seule.